While Stitch may not be a mega celebrity, he is pretty famous in my book! My first ever celebrity (almost) encounter happened entirely by accident, and I didn’t have the confidence at the time to just jump in and say hi! But I did snap a few photos from the distance. Eva Mendes & Will Smith, 2004 || It was summer & my first year of college was complete. And all of my brand new friends had planned a trip to meet up NYC. This was my first trip to the big apple, and we went everywhere we could in a short few days on foot. On one of our walks we ended up near the waterfront, and came upon a movie set for “Last First Kiss.” From where we were standing we could see one woman signing autographs. So we asked the production staffer standing on the edge, who that was. She replied that it was Eva Mendes – which we had to ask, “Oh, and who is that?” In 2004 she wasn’t a big household name yet. At that time her biggest role to date was in the 2 Fast 2 Furious. A movie none of us had seen, so even though we weren’t sure what was going on, we hung out and snapped photos anyway. Then a minute or two later the staffer we were chatting up asked, “Do you see that man in the blue shirt?” (see my arrow in the photo above). This actor was currently being misted with water & acting in a scene, where his shirt was continuously being ripped off by a taxi car door… ‘Um, yeahhh we see him!’ The staffer explains “Well that one is Will Smith.” Shocked, and giddy we waited around until we heard them shout CUT. This is when all of the on lookers swarmed him. A few of the girls were able to get close and grab a quick photo, I was not one of them! I was too busy being polite standing at the back of the mob. Still this is definitely one of those stories I will be telling my kids’ kids when they are older. PS The movie’s title was changed before it hit theaters, every heard of Hitch? Side note: This was the age before camera phones where really the norm, so it was amazing that any of us even had any photos of this entire story. And the fact is we were in this area in the first place because I stopped to buy new batteries for my digital camera! Amy Axelrod, 2009 || At the time I was substitute teaching regularly in a few local school districts. One of which, my own elementary school librarian was working at. I would often stopped in to say hi and fill her in on what I have been up too. She asked if I wanted to help out and substitute for her one day because she would need a hand with an author Meet & Greet she had planned. Being the book nerd I am, I of course said yes! This is a regular type of event that happened when I was elementary school, and I even have several signed books because of them. So I made sure to pick up a few of Amy Axelrod‘s books before the event day, and I asked her to sign them. I loved that her entire book series was on math, not something you find very often! Blake Shelton, 2009 || Later that same year Hubb’s friend got us backstage at a local concert to meet Blake Shelton. I wasn’t quite into country as much then, as I am now. While we didn’t get to chat much, I do remember how TALL he was! Always a thrill to meet someone famous, and then see them become an icon. I don’t think you can mention the name “Blake Shelton” and have people not know who he is! So it’s a bit surreal know that I had met him. Jordan Burroughs, 2012 || One of my closest friends was getting married, in August that year. The London Olympics just ended, and through out the games she kept mentioning Jordan Burroughs. While I had watched most of the Olympics, I wasn’t well versed on my Olympic wrestlers (I watched a lot of gymnastics!). Turns out that one of the bride’s best friends was dating Burroughs, who had won a gold metal at the Olympics! My friend also had mentioned he might be able to make it to the wedding. At the cocktail hour I was telling Hubbs this, as I saw Jordan from across the lawn. Then wondering out loud I said to Hubbs, ‘I wonder if he has the gold metal with him.’ Then before I knew it Hubbs was trekking across the lawn saying ‘let’s go ask.’ Have you ever had the chance to hold an actual Olympic gold metal? It definately feel a lot heavier than it looks! Plus if you just won a gold metal, wouldn’t YOU carry it around in your pocket! Made for a great story for not only the bride & groom but also all of the guests. 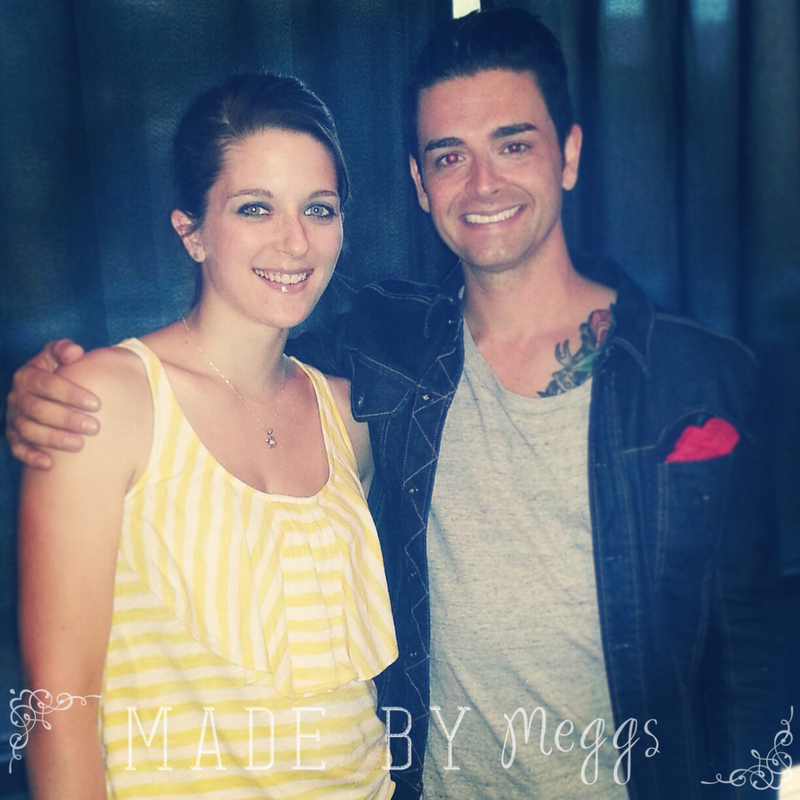 Chris Carrabba, 2014 || My Sister-In-Law (SIL) reminded me, once I had shared this post’s link on my Facebook page and I quote “I feel like you are forgetting one of the best days of my life.” And included the above photo! DUH, how could I have forgotten?! Let me back track & tell the story of that night! My SIL had purchased tickets for a new band called Twin Forks, they were playing a small venue in our city. Now I had never heard of this band, but I said yes because a) My SIL and I always have a fun time out and I love trying something new. Then she tells me more, the band is actually a new group of Chris Carrabba‘s, who was/is the lead singer and guitarist of Dashboard Confessional. Which we both love! The night of the concert we arrived and were kind of waiting around for the opening acts, and I decided we should go check out the merchandise. Plus we both knew we wanted to purchase the album before we left. And we rounded the corner, and wouldn’t you know! Standing next to the table was Chris himself. My SIL was shocked to see him & a bit nervous to just march right up there. I on the other hand, was too excited to pay much attention to my nerves — “Hey Chris, she is your BIGGEST fan” pointing at my SIL! Needless to say it was awesome to meet him, snag some photos with him and we even had him sign our albums while he chatted with us. Only to later climb up on stage and completely blow the entire crowd away. One of THE best shows I have ever been too, and even a year later we are still talking about it! Thanks for reminding me!! Thanks to the Joanne from Life With Joanne & the Bodacious Bloggers for welcoming me to the group this month! I look forward to sharing more next month. Now tell me have you ever had a celebrity encounter? Share your story in the comments below! I’d love to hear who you have met! Don’t forget you can follow me for more fun on Facebook, Instagram, Twitter & Pinterest. Wow….Blake Shelton…oh my I would love to met him. I am a huge country music fan. I didn’t know the level of awesome this was at the time!! But good memory for sure!! Blake! OMG! Jealous! I loved seeing how many you have met! Me too! I was surprised there were so many once I started looking for photos! Looks like you have met a variety of famous people. I love that you included authors too. And, woah, Blake Shelton, how awesome!